The Archbishop of Canterbury is Metropolitan Archbishop of Ceylon. The Archbishop of Canterbury exercises jurisdiction over the Church of Ceylon as metropolitan. The senior bishop of the church is the Bishop of Colombo, the Rt. Rev. Dhiloraj Canagasabey. 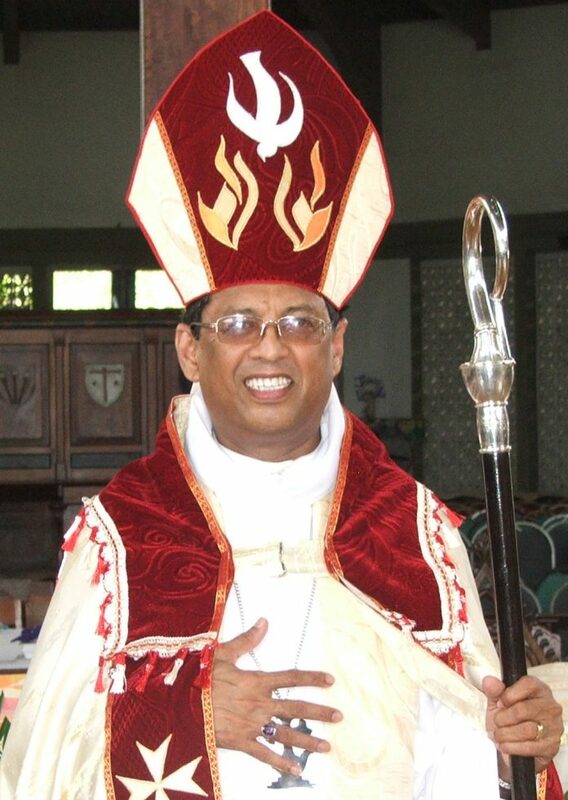 Bishop Canagasabey was born on 23 May 1955 in Batticaloa, Ceylon and is of Tamil descent. He is married to Harshini, a Sinhalese from Colombo and they have a daughter Dhilukshini and a son Dhiranjan. As a young man Bishop Canagasabey was a management trainee in the hotel industry and worked for the Hotel Lanka Oberoi for five years. He trained for the ministry at the Theological College of Lanka in Pilimatalawa, receiving his certificate in 1977. He earned Bachelor of Theology and Bachelor of Divinity degrees from the University of Serampore and was ordained deacon on 27 May 1983 and a priest on 3 June 1983 for the Diocese of Colombo. After serving in the parish ministry he was appointed Archdeacon of Nuwara Eliya in 1997, and also served as chaplain, then acting headmaster of St Thomas’ College, Bandarawela. He was elected bishop at meeting of the diocesan synod on 5 March 2011, and after Dr. Rowan Williams gave his assent, he was consecrated 15th Bishop of Colombo on 14 May 2011.